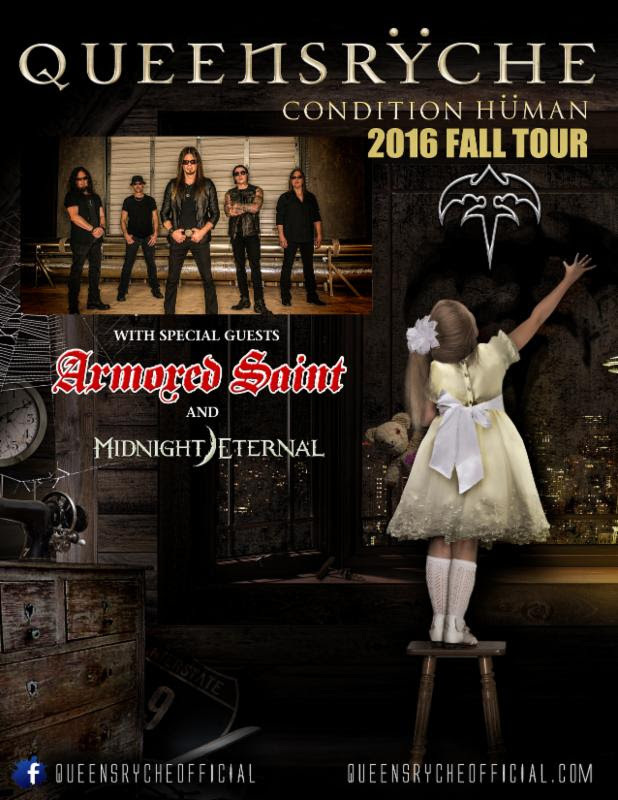 Next week, ARMORED SAINT will join Queensrÿche and Midnight Eternal for a US tour. Set to commence on November 15th in Seattle, Washington, the trek will run through nearly two-dozen cities, coming to a close on December 15th in Colorado Springs, Colorado. ARMORED SAINT will be touring in support of their Carpe Noctum release. As previously announced, the band has teamed up with PledgeMusic to offer fans a brand new live album. Having toured with Metallica, Whitesnake, Alice Cooper, The Scorpions, and many other artists since their inception in the early ’80s, ARMORED SAINT has always been a highly regarded live act, not only in their hometown of Los Angeles, but around the globe. The only official release to capture this, however, is 1989’s live album, Saints Will Conquer, until now. Carpe Noctum was captured at the band’s 2015 Wacken Festival set, as well as their headlining show in Aschaffenburg, Germany. For a first preview of Carpe Noctum, the live version of “Aftermath” is now available exclusively for pledgers at PledgeMusic: pledgemusic.com/armoredsaint, where the album can also be preordered in various formats and bundles, with every “pledge”/purchase receiving a digital download of the tracks, plus behind-the-scenes content, including footage from Wacken 2015, plus 2016’s Ozzfest, Queensrÿche appearances, and more. This entry was posted on November 11, 2016 at 8:12 pm and is filed under classic rock, Heavy Metal, Metal, Music, news, rock music, world news with tags armored saint, classic rock, Heavy Metal, metal odyssey, queensryche. You can follow any responses to this entry through the RSS 2.0 feed. You can leave a response, or trackback from your own site.